The Molcajetes we carry are completely hand carved by our artisans in Mexico from a single block of the best quality basalt volcanic rock through a laborious chipping process. Extremely popular in Mexican cuisine, it is an essential tool for making guacamole and other salsas, and great for grinding herbs and whole spices. They have an extra deep bowls, excellent for making guacamole and other salsas. The well crafted pieces also make for a great presentation on a table to present dips and other sauces. Two piece set including a semi-cylindrically shaped tejolete (pestle), also made of basalt volcanic rock. The Molcajete (mortar) has been used in Mesoamerican cooking since ancient times and is among the world’s oldest kitchen tools. Dating back several thousand years, it is known to have been used by the Aztecs and Mayans, yet still extremely popular today in Mexican cuisine. 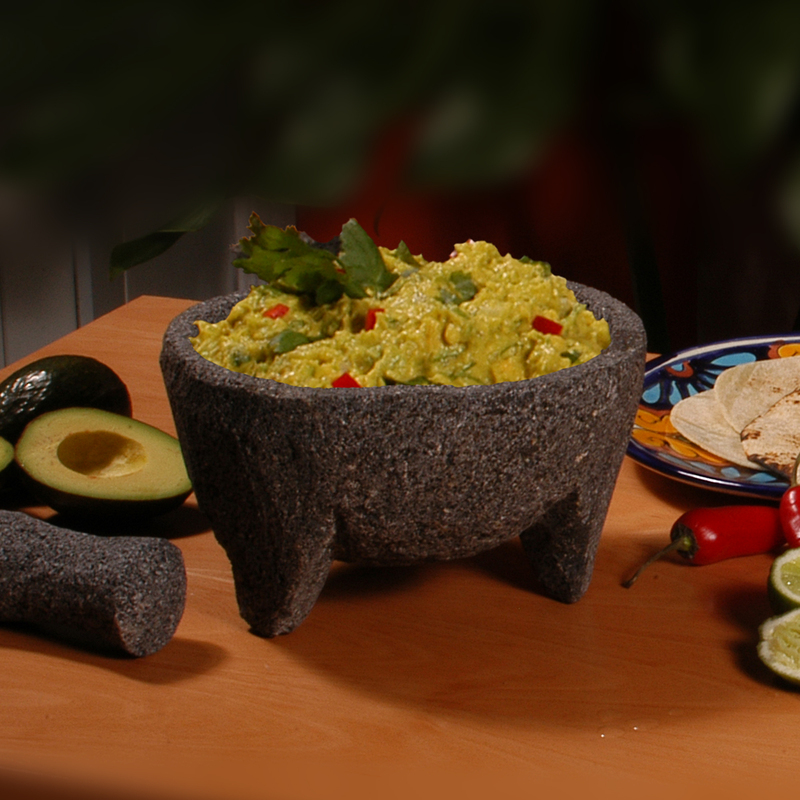 The Molcajetes is completely hand carved from a single block of basalt volcanic rock by artisans who for generations have kept this beautiful Mexican tradition. Each piece begins by cutting small blocks from the basalt rock and laboriously hand chipping away until the form is achieved. The hand chipping process can take as much as six hours, and results in each piece being totally unique. The earthy texture created by the Molcajete is quite distinctive, and due to the seasonings of the Molcajete, will carry a subtle difference in taste which can’t be duplicated in a blender. The rough rock surface is superb for grinding, and it always stays rough due to the tiny bubbles in the rock which emerge even if ground down, ensuring you will enjoy your Molcajete for many years. For best result, do not put your Molcajete in a dishwasher, instead hand wash it under running water, using a mild soap, avoiding strongly scented soaps which can flavor the rock. In fact, some people do not use soap at all to better retain the flavors. Dry thoroughly. To sanitize a Molcajete, clean the entire piece well with soap and hot water, then rinse and place it in a 350 degree oven for approximately 15 to 20 minutes. Before using the first time, a Molcajete should be “broken into” to make sure that there are no small grains of rock that can become loose when used for the first time. You do this by grinding a handful of raw rice several times in the bowl of the Molcajete with the tejolete using the rice as an abrasive agent to grind the surface of the bowl smooth. Keep grinding the rice until it becomes grey from the rock “dust”. Empty the bowl, and keep repeating the process with new rice until the rice no longer turns grey. Some people prefer to do this outside as the grains of rice tend to grains jump out. Although a laborious process, once done, you will never have to do it again. Some rice flour will remain ground into the surface of the rock, but this does not create any problems. As with cast iron skillets, Molcajetes with use become “seasoned”, carrying flavors from one preparation to another. The more you use your Molcajete, the more seasoned it will become. You can jump start the process by seasoning the bowl prior to actually preparing your first recipe. You can do this by grinding several cloves of garlic along with some kosher salt, cumin seeds, and some cilantro sprigs. Let this paste sit overnight so the Molcajete can absorb the flavors. Wash as above, and you are ready for you first recipe. Product looked great, but was difficult to clean due to all the crevices.